Texan Joe Stack burned down his house, then flew his light plane into the Austin, Texas office building that housed the Internal Revenue office on Thursday, February 18, 2010, killing himself and one IRS employee. No reasonable person will support and defend the actions of Mister Stack. But that’s not why I’m writing this article. 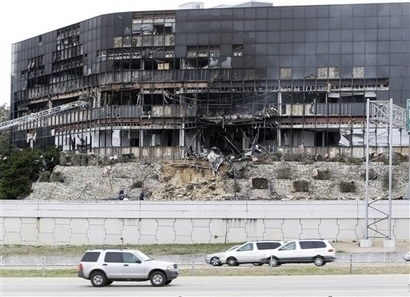 Joe Stack flew his plane into this Austin, Texas building that housed the IRS offices, killing himself and one employee. My concern is that this single act portends future events. Very soon our American economy will collapse. The suffering will be felt from coast to coast. Many hundreds of thousands of people…perhaps millions…will die from starvation, crime, weather and disease. There is already much talk about whether Washington would declare martial law in the wake of a collapse. If they do, and begin to clamp down hard on the behavior of all Americans, I can envision attacks like the Stack attack all over America. But Americans are not suicide bombers in general. Still, is it hard to imagine Improvised Explosive Devices (IEDs) being used against Federal targets? If there is even one state that pulls up its collective “big boy pants” and secedes from the Union, Washington might retaliate with armed invasion of that state. A guerrilla war will ensue. And Federal facilities will be prime targets for that insurgent Fourth Generation warfare. Any state that has a “well-regulated militia” would be prepared to defend its own territory and citizens. Whether it would choose to defend the property of the American Federal Government is entirely another matter for discussion. The militia would likely not allow troops from Washington to guard their own property. So before you just read all the new stories about Joe Stack and dismiss him as just another anti-government nut case, think about what his actions could mean in the not-too-distant future. This entry was posted on Friday, February 26th, 2010 at 1:00 am and is filed under protests, Secession, Tyranny, War. You can follow any responses to this entry through the RSS 2.0 feed. You can leave a response, or trackback from your own site. Okay, I’ll bite. I believe that any/all “Federal assets”, land, buildings, and military installations within a seceding state will be taken over by that State. These will be essential to the defense of that new Nation. The history of the Civil War forces a conclusion that there will be another upon secession. Alliances will become essential. It’s not a pretty picture, but we can no longer sit around and pontificate. The last bastion of Liberty is tottering on the brink of extinction. When will humanity finally realize a rallying point and proceed to Action? Can we find a way less painful than State secession? If the price of disarming and looting the Individual Sovereign Human Being was always death to those attempting such…would not such a price produce a condition of polite society, good neighbors, and free market voluntaryist agorism aplenty! Sooner or later you’ll need to decide which one you claim to be…and then live or die by that decision. What the hell are you waiting for, start starving the monkeys today! LOL, one of these days, after the collapse really hits bottom, I can tell you about many years of starving the monkeys. Atlas Shrugged became my bible in 1964.